Metabolism is the process by which your body changes food into energy. Simple carbohydrates such as white rice are easy for your body to break down and digest, so they metabolize rather quickly. Understanding how your body metabolizes white rice and other simple carbohydrates can help you realize why these types of foods, when eaten in excess, can be detrimental to your blood sugar levels and health. 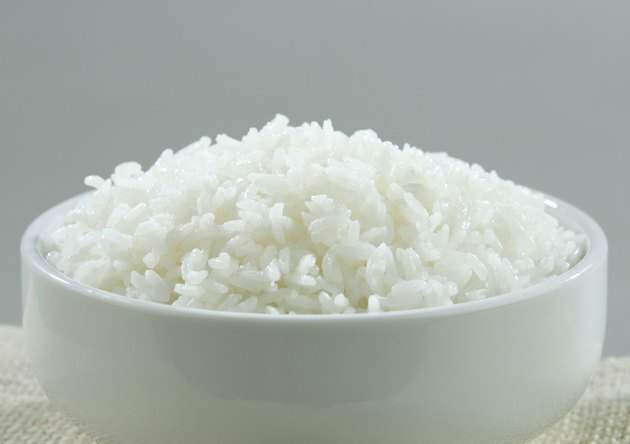 Approximately 85 percent of the calories in rice comes from carbohydrates. Your body begins carbohydrate metabolism in the small intestine where the simplest sugars -- straight fructose or glucose, for example -- are absorbed into the bloodstream. Rice has only trace amounts of these simple sugars. The body then converts the more complex chains of carbohydrates in rice to glucose. You release the hormone insulin to facilitate the transfer of this glucose into the cells -- mainly the liver and muscles. To some extent, other organs also metabolize glucose. Your liver and muscles change glucose into glycogen, a stored form of energy for the body. This process, called glycogenesis, ensures you have energy to burn off at the gym later. If you eat too many carbohydrates, however, and your body does not need them for glycogen stores or for immediate energy, you store the extra rice carbs as fat. Brown rice still has the outer layer intact; it contains most of the nutrition and fiber of the grain. Your body metabolizes brown rice in the same way, but it takes longer because the grain is more complex. The higher fiber content makes your body do extra work to convert brown rice to glucose, slowing down the process of releasing sugar into the bloodstream and the subsequent glycogenesis. You may feel full for longer after eating a whole grain such as brown rice than you do after eating refined white rice or other simple carbohydrates because your body takes longer to process them. A diet that consists primarily of white rice and other refined carbohydrates can put you at a greater risk of certain diseases, particularly Type 2 diabetes. These refined carbs cause too much sugar to be released into your bloodstream too quickly, disturbing the release of insulin. When your insulin levels are off, you cannot store the energy in your cells, and end up with too much blood sugar circulating in your system. The result is reduced immunity, higher blood pressure, weaker arteries and poor oxygen transportation. An occasional meal including white rice will not necessarily cause these results, but a steady diet of white rice, white bread and sugary baked goods might. Does Rice Make You Gain Weight?